At 10 years old, Apollo’s world came crashing down around him. The killer that lurks everywhere he looks, AIDS, took both of his parents, leaving him orphaned and alone. What were your greatest fears at age 10? Did you ever wonder who would take care of you, make sure you eat your vegetables, and get to school on time? Apollo’s heart ached after losing his parents, and even though he was able to move in with his grandmother, he still felt alone. His grandmother was too old and frail to take care of him. He was on his own. At only 10 years old, Apollo looked for work and took odd jobs just to put food on the table. But it was too much for such a young child, so he gave up. Apollo ran away from home at 10 years old. One day, help came, in the form of a police officer. Apollo was picked up during a police rescue mission and brought to the Buloba Kinship Home in Uganda. Now, Apollo needs your help. Your gift of $50/month to the Buloba Kinship Home will tell Apollo he is not alone. Your gift can put food on his table, put nice clothes on his back, and send him to school, like 10-year-old boys should. 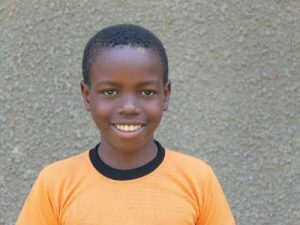 Your gift can encourage Apollo as he wants to one day be a pastor and help orphans like himself.